One feature of managed code is dynamic, and automatic, memory management. While easing the complexities of the development process by abstracting out memory management significantly, memory managers add overhead. 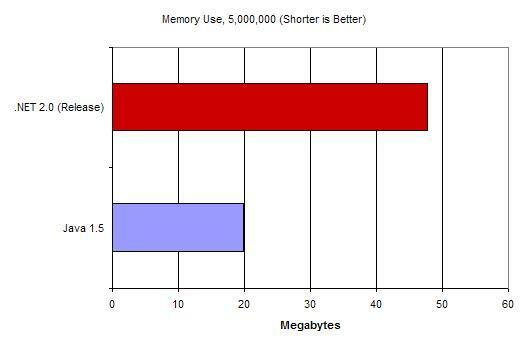 Both .NET and Java use more memory to store the same data in RAM than the venerable C/C++. In this test, we will pit the memory managers of Java against .NET in comparative memory allocation tasks under Windows XP. Again, we have a clear winner – Java 1.5. Note that all of our graphs start at zero to give as fair a comparison as possible. 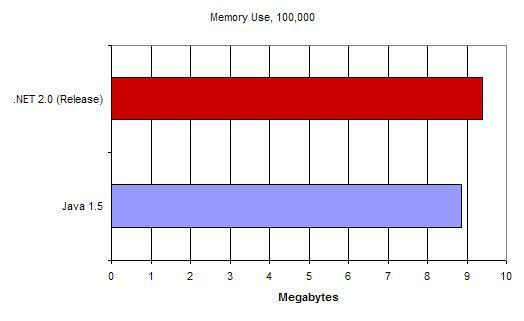 .NET is using more than twice the amount of memory Java uses to store the same amount of data – 19.9 MB versus a whopping 47.8.